A strong ethylene cycle starting today and lasting through 2020 could propel valuations for DWDP, LYB and WLK well above current levels – driven by strong earnings revisions. WLK and LYB have the greatest upside: > 50%. Increased demand because of the damage cause by the hurricanes in the US. Decreased supply – lost production in the US and delays to the start-up of some of the new US ethylene capacity. Plus, a well-balanced market to begin with. Ethylene demand growth is robust, increasingly driven by polyethylene and the consumer rather than glycol and PVC in industrial and building applications. That said, PVC is having something of a renaissance, driven by infrastructure (water) investment in India and now boosted by the hurricane damage in the US. Expected trough operating rates by the major commentators for 2018 were only a couple of hundred basis points lower than 2016 – when the market was robust and margins high. Our analysis shows that the US events reverse that operating rate drop. A strong ethylene and polyethylene cycle could conservatively add 15-20 cents per pound to expected margins in 2018 – boosting consensus estimates for LYB, the most levered company in the group, by 50% in 2018. LYB could add $1.5-2.0bn to free cash flow in 2018. Exposure is significant also for WLK – similar to LYB for ethylene – but with the added boost of PVC, somewhat held back by limited margin expansion in the old Axiall business because of the need to buy ethylene. For DWDP, current 2018 estimates could be low by as much as 30% – given the integrated nature of DWDP’s platform the company would likely not see the full polyethylene swing but would benefit from better margins in polyurethanes (because of stronger demand). The risk is that plants run better – achieving the on-line rates of the 1980s and 1990s – but given that much of the fleet is now 30-35 years older than it was at that time we expect to continue to see a high incidence of both planned and unplanned downtime. If 2016 was the anomaly and we need 94% operating rates for the market to get tight, as we did in 1987/88, then margin upside on a sustained basis is limited and we would expect continued price and valuation volatility. 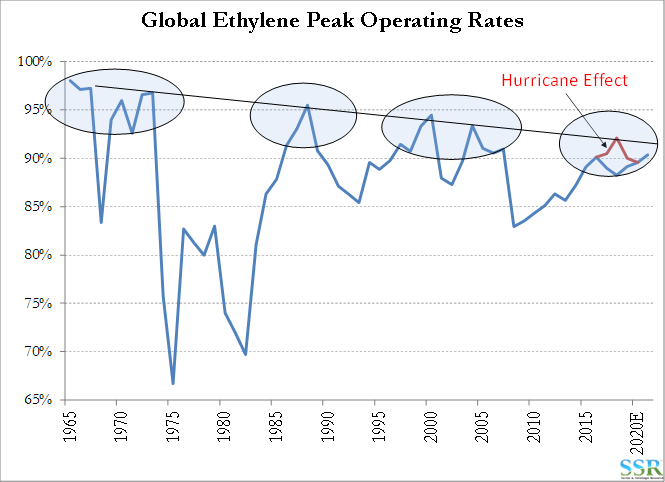 The global ethylene market has not seen a real sustained supply shortage since the late 1980s, with only a fleeting peak in the mid-1990s, which looked like it had some legs until the Asian financial crisis. It is important to note that a good economic crisis can always knock the wind out of any commodity rally. What we are now predicting for ethylene is just as vulnerable to a global or even large regional recession as at any time in the past. 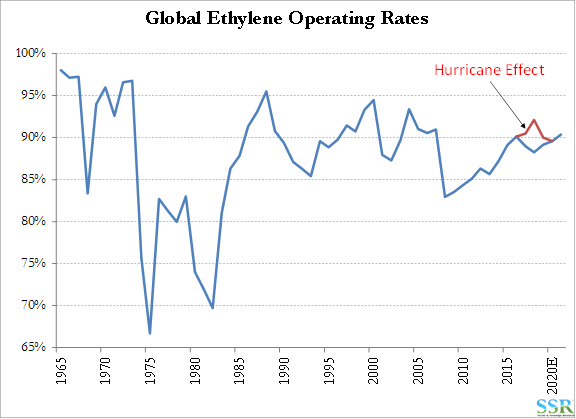 We are calling for a tightness in the ethylene market that might more resemble the late 1980s than anything we have seen since that time, but we do require the global economy to keep plodding along and especially the global consumer if this is to be the case. We have been writing for a couple years now that the rate of ethylene additions in the world is not keeping pace with demand growth on a trend basis and that the capacity additions in the US are a short-term “red-herring”, grouped together in one geography and causing much more of distraction than they would had one been in the US, another in the Middle East and the third in Asia. The ethylene derivative markets are truly global, and it is the availability globally that matters and how that matches demand. The forecasting mistakes made in the past, resulting in serious overbuilding again and again, surrounded the idea that ethylene demand growth would accelerate with population and GDP per capital growth – but it did not – Exhibit 2. The volatility of the early years is a function of the small size of the market and the overwhelming impact a swing in inventories had in an inefficient world. The only big inventory move we have seen since the mid 1980s was the 2008 financial crisis. Note that ethylene end use demand is very stable, given its consumer durables and staples focus and a lot of the volatility shown in Exhibit 2 is created by moves in inventory. The negative slope to the trend line is a function of efficiency and downgauging, without which the trend would likely point up and to the right. If we just look at the period from 1990 – Exhibit 3 – we see an almost flat trend line and a clear upward trend since 2012, which we would argue actually began in 2004 if you could scrub out all the noise. 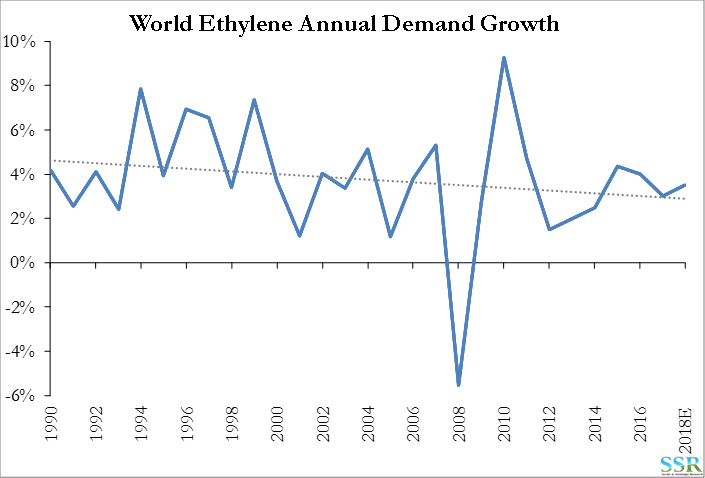 The upward trend, or at the very least an absence of a downward trend, is driven by a number of factors. The share that polyethylene and especially food packaging now commands of the ethylene total. Combined with the rapid development of supermarket and preserved packaged food in the developing world – coincident with some significant advances in food packaging techniques – more polymer – longer shelf lives. Polyethylene continues to experience demand growth in excess of 4% per annum and is now the lion’s share of ethylene growth. Reaching the limits of downgauging – how much thinner can film become before it is too difficult for us to use. The end of the decline in the styrene market – around 2009 globally. The decline was driven by the cannibalization of the CD, DVD and VCR markets by digital media. We believe that with the prevailing demand trends and economic overlay, ethylene demand can grow as much as 4% per annum through 2022, not without some volatility but with that trend or average. With global demand of around 150 million tons, we need as much as 6 million tons a year of new capacity to keep up. The expectation was that 2018 was going to be an operating low point in what was otherwise a slowly tightening market. Our view is that the hurricane damage now changes that picture completely – as summarized again below in Exhibits 4 and 5. We do not believe that in a market this large, the world can add capacity fast enough to bridge the gap and that the market tightens from 2018 regardless of whether we see a strong 2018 because of the hurricane issues outlined below. We will only see a significant wave of capacity post 2020 if margins from now through 2020 are high enough to cover the rising cost of investment and if potential producers can get comfortable enough with feedstock advantage. DowDuPont announced the start-up of its new US ethylene facility this week, together with its first accompanying derivative unit. When the plant was announced, ethylene margins were 40 cents per pound, driven by the oil/gas differential in the US. Prior to the Hurricane Harvey effects, spot ethylene margins in August were 2 cents per pound. The world is not awash with ethylene, so prices need to rise to encourage the next wave of investment. Note that while we are assuming that demand has to surpass 90% of production capacity to get margin support – ethylene has rallied at lower operating rates – Exhibit 6. 2012-2014 reflect the gas advantage in the US – producers in Europe and Asia lost money. 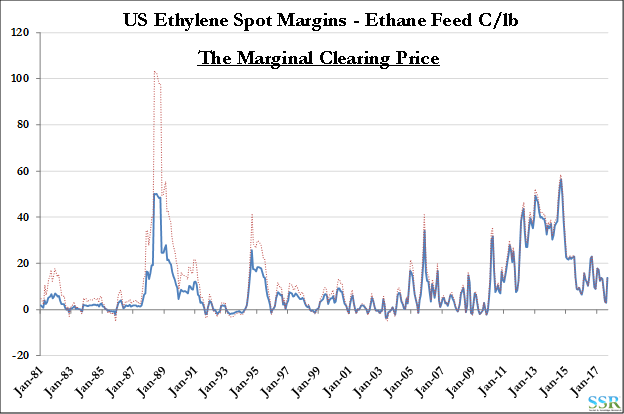 Exhibit 7 shows a very long-term history of ethylene spot margins (based on ethane feed) in the US – in dollars of the day. If we inflated the margins either with CPI or with the cost of construction, the only real prolonged tight – short supply – ethylene market of the late 1980s shows just how profitable the business was at the time – dotted line in the chart is inflated with the CPI. If we used cost of ethylene plant construction in the US as an index (we do not have the time series but we have current and historic based on when plants were built), the 1980s numbers would be even higher, as construction costs have outpaced CPI in the US because of skill shortages, tougher EPA and permitting regulations, etc. In 1988 and 1989 there was a 16-month period when the payback period on a new ethylene plant – at the then cost of construction in the US and Europe – was 8 months. A repeat of that situation today would require margins to rise to 140-150 cents per pound from the current 13.5! The spot ethylene price in the US is the indicator of what someone will pay for the marginal pound – either of surplus production or for the last pound in a tight market. 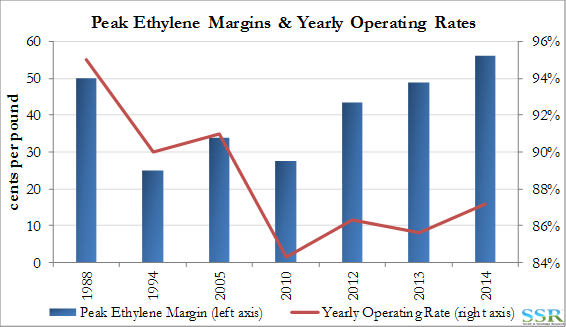 In the past, as shown in the chart, ethane based cash margins have fallen below zero – either because at the time other feedstocks generated lower production costs or because the marginal supplier was willing to accept pricing below cash cost but above variable cost. The marginal buyer in a trough is either someone who can export a marginal ton of ethylene or ethylene derivatives, or someone who can buy it for less than he can make it. In a tight market, it tends to be an exporter of PVC, VCM, EDC, ethylbenzene, styrene or ethylene glycol, rather than polyethylene as these products use much less than one pound of ethylene per pound of product. PVC is very often the marginal player. As the world ran out of ethylene in 1987, the spot price very quickly moved to the level that destroyed incremental demand, either because consumers decided to work with less inventory (very rare) or could not sell their product at much higher prices, or where there was a non-chemical substitute – containerboard in packaging, for example. In 1987, there were zero plans on the table to build any ethylene capacity anywhere in the world (except for one facility in the Middle East) – the inflationary pressure of higher oil prices had reduced demand growth dramatically at the time and there was skepticism with respect to whether the industry would ever be profitable again. It was demand growth outside the US and Europe that caught the industry by surprise. Today, there are plans to build, both in North America and elsewhere, but they do not appear to us to be enough to keep pace with what is very robust demand growth globally, led by polyethylene, but helped recently by stronger global demand for PVC. If, as we expect, the recent production and demand changes in the US lead to a tight market, the marginal buyer of spot ethylene will likely be an exporter of PVC but possibly this time also polyethylene. How High Could Prices Go? Whether or not our near-term projections are correct, at some point in the next couple of years the world is likely to run out of ethylene, unless demand patterns change. Capacity plans are not sufficient to keep up with demand growth. Feedstock advantage – critical in making an adequate return. Construction cost over-runs – some have been extreme and result in uncertainty around what the real cost of new construction might be. At the point at which supply falls short, prices will rise to achieve one or both of two things – discourage consumption and encourage production. Consumption is harder to discourage because so much of the consumer durable and staples markets involve mass production – packaging is part of the food preparation process and the cost of change would be high. Plus – polyethylene is not that expensive – especially if we adjust history for inflation – Exhibit 8. This does not account for downgauging, which has been another constant in this industry – doing the same job with less polymer. From a “value in use” perspective, polyethylene costs for a user today are likely less than 25% of what they were in the 1980s, in real terms. Polyethylene can easily run back up to $1.00 per pound in our view before we would expect to see demand destruction. At current costs that would add around 45 cents per pound to integrated ethylene/polyethylene margins – 3x the improvement that we show in Exhibit 1. On the supply side, we have now seen a couple of examples of companies paying well in excess of $2.00 per pound for ethane based ethylene capacity in North America, and while Dow may have come in close to $1.00 per pound – Dow and Exxon are the experienced builders and are the exceptions rather than the rule. At $1.50 per pound, with 15-year depreciation and a desire to make a 15% return on investment, cash margins (EBITDA) on ethylene need to exceed 33 cents per pound. A 10% return lowers this to 25-26 cents per pound – FOR THE FIRST 15 YEARS! We were at higher margins than this in 2012, 2013 and 2014 – but only for a period of 3 years – since the end of 2014, spot margins have averaged 14 cents per pound. Polyethylene margins have been higher, but not high enough to pay for ethylene and polyethylene capital costs. Note that this is in the US – the place with the feedstock advantage! 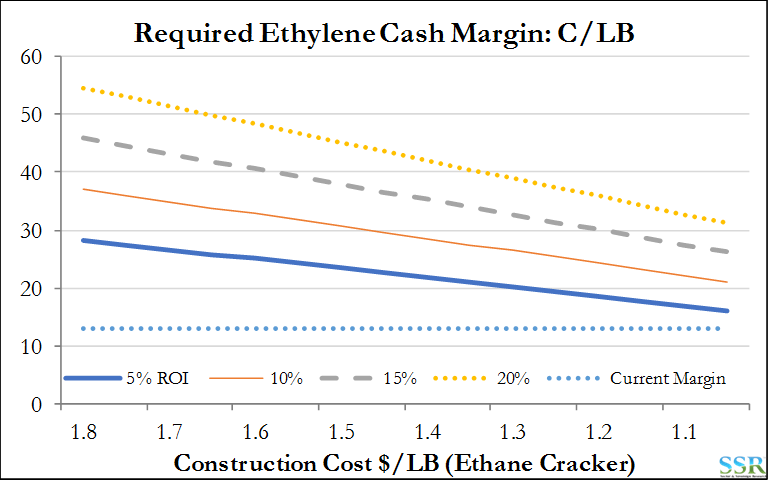 In Exhibit 9 we show the margins required on a new ethane based ethylene plant in the US to get a series of returns for a range of construction costs. 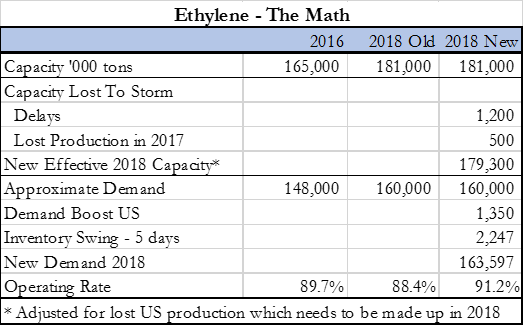 Note that while Dow has come in close to the bottom of this construction cost range, both Braskem and Sasol likely spent/will spend more than $2.00 per pound. Ironically, margins have been better in Europe and Asia for the last couple of years because prices have reflected shortage and a need to pay for imports from the Middle East and the US. It is an impossible capital case to make on the basis that you are going to sell the ethylene, so the builders will be those depending on integrated economics through derivatives. For the math to work – however – we still need an integrated margin expansion of at least 20-30 cents per pound from current levels – again higher than the assumption in Exhibit 1. Dow Chemical was the only ethylene exposed publicly traded company in the 1980s for which we have reliable and consistent data. EPS from 1985 to 1990 is summarized in Exhibit 10. 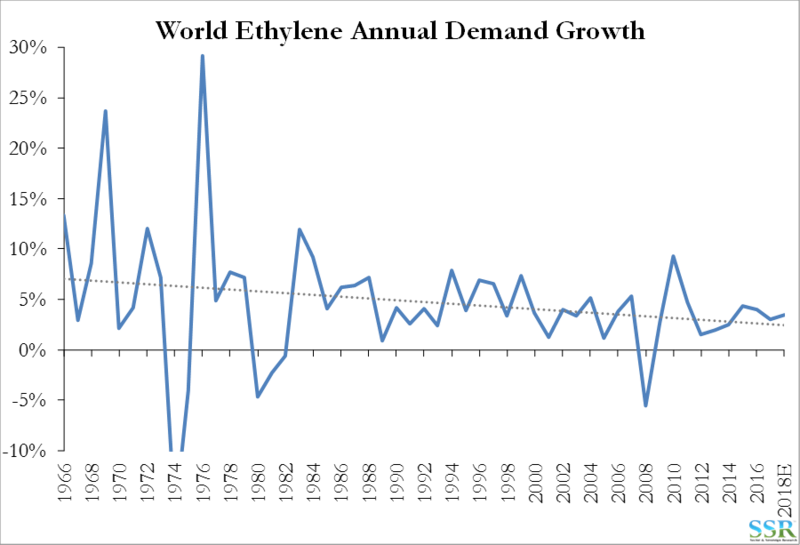 We also show our estimate of “normal” earnings over the same period, based on trend return on capital. 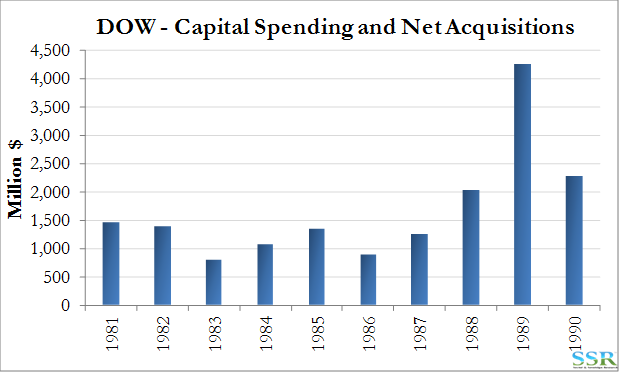 The rise in the normal line, which accelerated in 1988, is a function of the aggressive step up in capital spending at the company during that period, in part to expand ethylene capacity, increasing capital employed – Exhibit 11. In the middle of 1988 Dow’s EPS peaked at 2.6x normal and valuation peaked at around 50% above normal value – not surprisingly not giving Dow full credit for the earning increase, which was seen to be a cyclical high – Dow traded at just under 7x peak EPS. It is important to note that the S&P500 was trading at 11.5x earnings in 1988 versus the approximate 20x today. 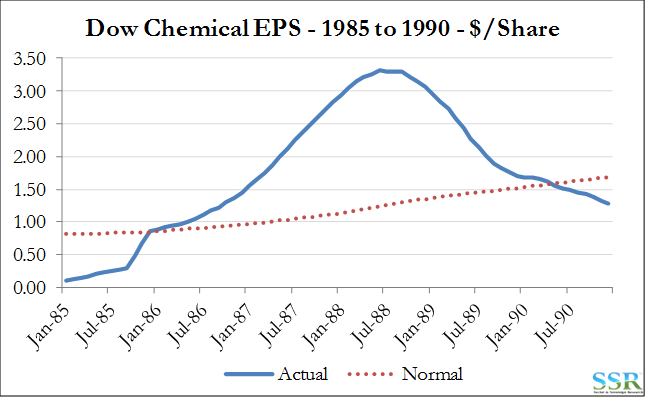 Dow of the 1980s is a good proxy for DowDuPont today as at the time Dow had less than 10 pounds of ethylene per share, versus more than 12 pounds for DWDP today, but it is not a good proxy for valuation and EPS growth, in that the EPS growth associated with the 1980s cycle was around a very low base – we would not expect DWDP to trade at 7x peak EPS (or at 12x adjusting for the S&P multiple) – we would expect a marginally higher multiple to reflect the larger base of business. However, Dow of 1980s might be a reasonable proxy for LYB or WLK today, as they have much higher leverage to the ethylene cycle. A 50% premium to our normal value for DWDP would push the stock to $100 (giving credit for the expected deal synergies). A 50% premium to normal value for LYB would push the stock to $175 per share. A 50% premium to normal value for WLK would push the stock to $170 per share. In Exhibit 12 we show the global operating rate chart again and the decline in “Peak” operating rates that we are relying on to generate tight market conditions today. The risk is that the trend is incorrect and that in a tight market we can see rates rise closer to 95% again as we did in the mid-1980s. New capacity should be able to operate at or close to 100%. Higher prices will encourage marginal facilities to run at higher rates. How accurate is the historic data – we are relying on data that is 30 years old for peak operating rates when information with respect to some markets – such as the former Soviet Union and Japan was murkier than it is today. The older plants are now very old and run time suffers because they require more frequent maintenance – over half of the ethylene units running today are more than 25 years old. If you push a plant harder – especially an old plant – there is greater risk of failure – perhaps significant failure – Shell had this problem in the Netherlands recently. Tighter EPA and other regional regulations require plant upgrades and other maintenance. Clearly, if the ethylene capacity around the world can be pushed harder it will be more difficult to get the sustained higher margins we are calling for. Recently we have seen strong margins in Europe and Asia with global operating rates below 90%. Further – the mid-90s profit peak occurred with rates below 90%.